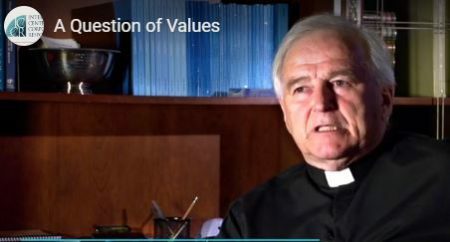 The Interfaith Center for Corporate Responsibility (ICCR) has produced a new 17-minute film “A Question of Values” summarizing the history and current mission of this coalition of faith communities impacting environmental and human rights issues through shareholder advocacy. This coalitionition of over 300 global institutional investors currently represents more than $400 billion in managed assets. Leveraging their equity ownership in some of the world’s largest and most powerful companies, ICCR members regularly engage management to identify and mitigate social and environmental risks resulting from corporate operations and policies. Fr. Séamus Finn, OMI, is the current Board Chair of the ICCR, he is one of several individuals interviewed for this film. Click here or on the image to see the 17-minute film.